Many business owners or fleet and equipment managers cringe when the time comes to purchase new service trucks. When you don’t work out of the vehicle that is being purchased, it can be a challenge to understand the daily application and requirements. Incorrectly “spec’ing” the vehicle translates into lost ROI, safety issues and unhappy techs. The work truck is the mobile office of the technician. It can also serve as the shop, break area and more. Regardless if they are HVAC techs, plumbers, mechanics or electricians, they all depend on their work truck on a daily basis. With the next work truck purchase approaching, be sure to gather this information from the techs to ensure it is set up to be efficient and safe. Thoroughly understand what is stored on the vehicle. Are there a lot of hand tools that can be found quicker if a set of mechanics drawers are provided? Do they carry a lot of hardware or small parts that warrant parts bins. Does any larger equipment (think ladders) or materials (think pipes) eat up too much space in the bed? If the tech spends 15 minutes on every job site just trying to locate and retrieve what they need on the vehicle, it is time to increase organization which will lead to better efficiency. Are there repetitive motions being performed that put the tech at risk of injury while on the job? For instance, are they stepping up and down on a tall bumper or lifting heavy components or equipment in and out of the bed? 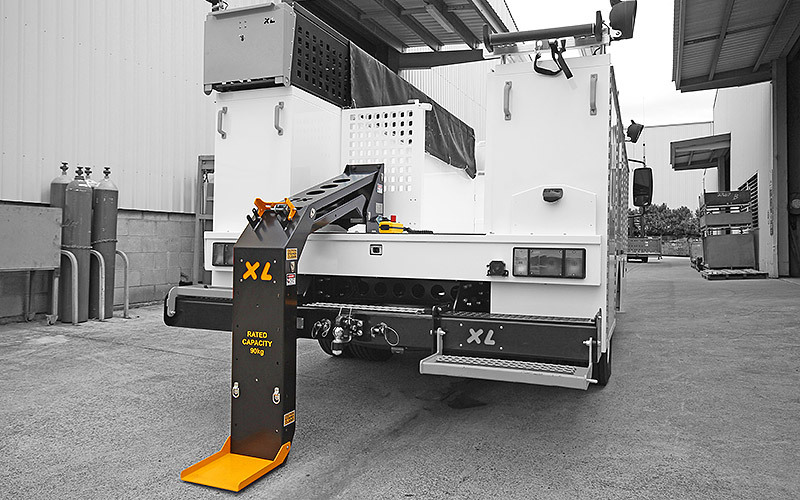 Items like steps mounted to the rear or the XL TOOL LIFTER can alleviate these dangerous repetitive motions. Without asking, you may never uncover these issues. While creature comforts in the cab may seem like just convenience to you, for the tech they may make the difference between happy on the job and feeling appreciated or hating to go to work every day. These can be as simple as door ajar alarms or as big as central locking. Last, but certainly not least, are safety and security. Is the tech having rear visibility issues when reversing on a job site or attempting to hook up to a trailer? Are their tools and equipment commonly stolen when working in high-theft areas? Investing in rear vision cameras and enhanced security options can make a huge difference in the safety and security of the work truck. While work trucks can be a major expense, business owners and fleet managers also realize service trucks are a major contributor to revenue. However, with all businesses there are budgets to maintain. No one understands the position of the company better than a business owner or fleet manager. Be sure to take the following items into account prior to the next work truck purchases. The jobs that are being done today may change dramatically a few years down the road, depending on the growth and direction of the company and the industry. Many companies will keep work trucks in service for a long period, some for 10 years or more. Keep this in mind as the service trucks may need to transition along with the business. Cost will always be a major limiting factor with service truck purchases. While the techs may want the Rolls Royce, that can’t always be the outcome. Maximize the value by creating the best service truck possible with the money that has been allocated. Maintenance costs can drain the ROI directly out of a work truck. Spec a service truck that has a solid reputation of reliability and performance. Sometimes, the best place to obtain this info is from other business owners or fleet managers or by giving us a call at Service Bodies Australia. Remember, take into account both sides of the coin in order to produce the best possible service truck.